Two art exhibitions open on campus within the next week – a welcome respite for eyes buried in books or strained after too many hours hunched over a laptop. 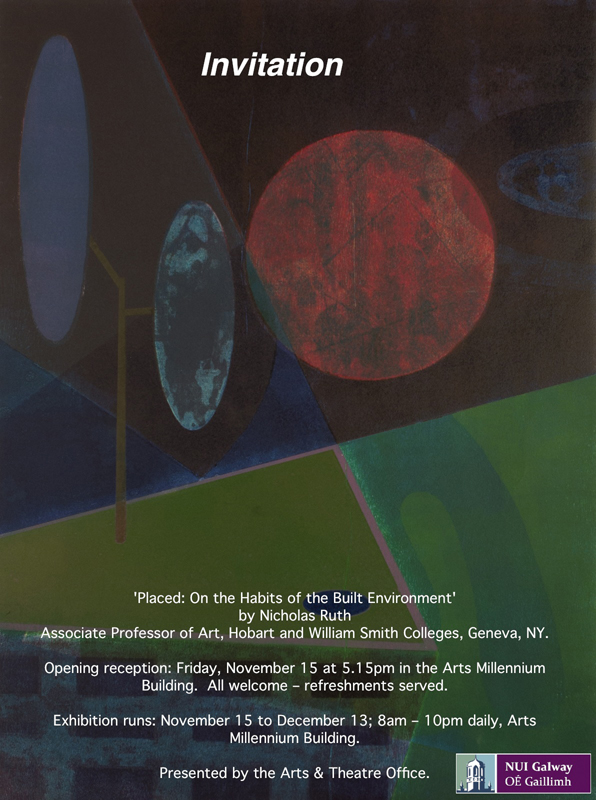 On Friday 15 November the ArtsMillenniumBuilding will host the opening of Placed: On the Habits of the Built Environment, which is the work of United States-based Professor Nicholas Ruth. Friday 22 November sees the launch of Taking Note or the Curious Eye, which is being curated by Robin Jones. This exhibition will take place at the art gallery. To that end, he has brought together works by – among others – Joe Fyfe, Will Self, Paul Doran, Karin Ruggaber and Sylvia Bachli. Digital information, sketchbooks, notes books and even “the back of a fag-packet” are also ways in which we record how we “note” our world. Placed: on the Habits of the Built Environment can be viewed in the public space of the ArtsMillenniumBuilding, until 13 December. Taking Note or the Curious Eye runs at the University art gallery in the Quadrangle from 10 November to 20 December, Tuesday to Saturday, from 12pm-4pm.